There are times when you realise your list of data is in the wrong order; for example in rows 1 through 4 you have D then C then B then A. You realise you need the list to be reversed, with the order being A then B then C then D. Unfortunately, there is no formula or option that allows you to do this easily. However, it can be done! I have searched on the internet for a while and I haven’t been able to find anything that is relatively simple. I then thought about it and came up with this solution. The reference cell is the last cell of data in the list. Let’s look at an example. Let’s first focus on the REVERSE ROWS – Numbers section found in columns D and E from rows 9 to 15. You can see how cell D15 is highlighted. This is the reference cell. This is the end of the original list; it is the value which you want to put at the START of your new list. This cell becomes the anchor for the three separate formulae that will be used to create the reverse. If there are a large number of values in your list, you may not be able to see the last cell in the list. If this is the case you can use the keyboard combination: Ctrl + Down Arrow to get to the bottom of the list. Note: If you do not have a continuous list,( i.e. a list that has blank cells in it) then pressing this combination once will only take you to the location of the first blank. To ensure that you have captured all your data, continue pressing Ctrl + Down until you are sure you have reached the end of your list. Remember this cell, as it will become an important factor in the next two formulae. Once you have set the first cell, you can then set the second cell. In this example, it is D14 and this needs to be located in E11. You could go into E11 and manually type this cell reference into the formula, but this could lead to mistakes. By using the reference cell, it will ensure that values in your list and not missed. This will then copy the value of of cell D14 into E11. Now, to complete the rest of the list, you could go through and change the formula to say -2, -3, -4, and so on, but this could also cause errors and is time consuming. Luckily, this step can also be automated. Why is count important? Currently we are trying to shift D13 (the third last value in the original list) to E12 (the third value in the reversed list). We have currently shifted a total of 2 numbers to their new positions. By using this fact, we can easily select the third value. The reference cell is still the same (D15), however instead of entering -2, the COUNT function is used. Starting from the first cell of the reversed list (E10) it the counts the number of cells have already been reversed (currently only two; which are E10 and E11). By placing the negative sign in front of the COUNT function, the OFFSET will then move up two rows. This then shifts D13 into it’s final location E12. You may have noticed the dollar ($) sign in the formula. This locks the reference, so when you grab the formula and pull it down (see below) the reference cell and the start location of the reversed list are locked and are not lost. This is critical, as when you pull this final formula down [=OFFSET($D$15,-COUNT($E$10:E11),0)] to cover the rest of the list, if the row reference is not locked, the formula will not work as desired. The reverse is now complete! The list is now in the opposite order! Now, setting the reference cell is again done by selecting the final cell that contains your data. (In this case, it can be found by pressing Ctrl + Right). 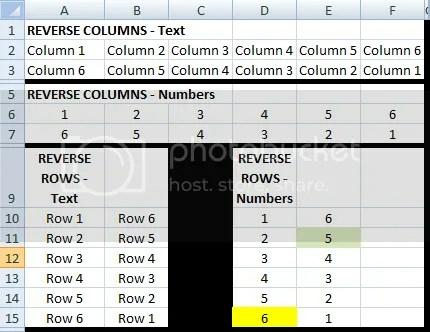 To use the formula as defined in STEP 3 above for columns, the offset and 0 need to be alternated. For example, see the column list of data in cells A6 to F6. As the reference cell is F6, and the start of the new list is A7. The count of reversed cells begins from A7 and moves across the columns, rather than down in rows. With one simple switch you can now reverse columns! This is all fine until you want to reverse cells that contain TEXT rather than numbers. The formulae for the first two cells are identical, however when trying to use the COUNT function, it will cause an error. This is because the COUNT function cannot handle text. To avoid this, swap the COUNT function for the COUNTA function. 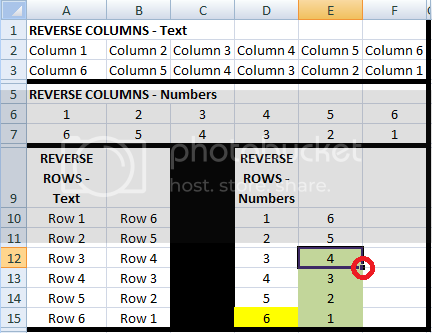 This function counts all NON-BLANK cells rather than those with just a number. In fact, you could put COUNTA into the formulae used for the reverse of numbers and it would work exactly the same. Hopefully these steps are clear and allow you to understand how I created a quick (but not so simple) way of reversing a list of numbers, whether they are in rows or columns. I wanted the formula to be the same so that there weren’t multiple formula to remember. I cannot remember exactly how I discovered this, I think I was searching online to find this and after putting together a variety of different pieces of advice on the internet, I came up with this solution.